INDIANAPOLIS — We often hear of blood shortages and a need for donors. The same problem exists at a milk bank on the Indianapolis Northeast Side. It’s a place where mothers donate extra breast milk to help babies in neonatal intensive care units where their mothers can’t breastfeed them. 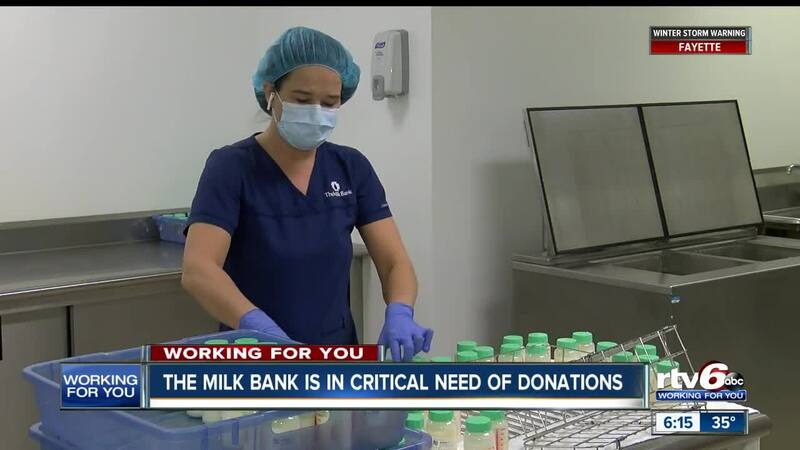 The milk bank is receiving more orders from local hospital than it can fill. Doctor Emily Scott has a three-year-old son. When Ambrose was born, he spent time in the hospital with a breathing problem and Doctor Scott needed donor milk. But the supply of breast milk faces a critical shortage and the milk bank is looking for mothers who are healthy and can provide 100 ounces of previously pumped frozen breast milk. A first ever donation milk drive is planned on January 24 from 3 to 7pm at the milk bank, 5060 East 62nd. Street. A second event takes place February 4, also from 3 to 7 p.m., at Community Hospital South.